I have known the Halfacre family for many years. I first met Randy (the Dad) when we opened our business in 2000 and he and I were in a BNI (networking) group together. 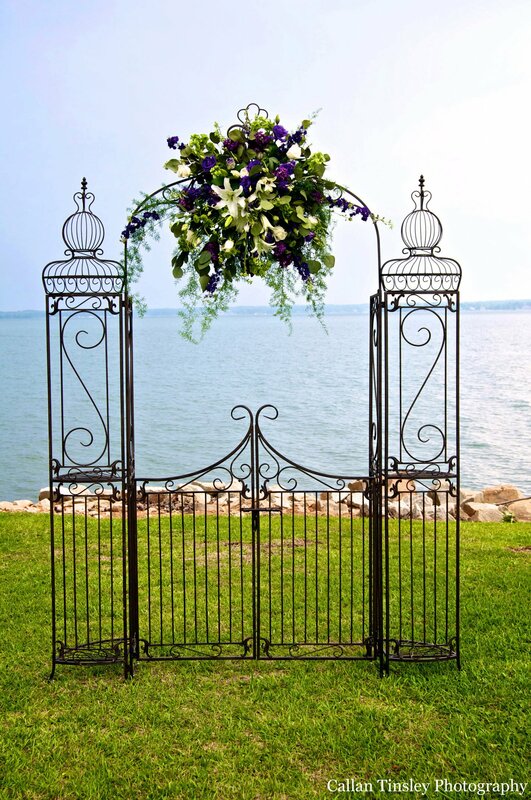 I was honored to do the flowers for their daughter Hope’s wedding back in 2009 and thrilled when they asked us to do the flowers for their youngest daughter Brittany’s wedding. The Halfacres are very family oriented, which is something that I can relate to and also admire. I am glad to know them and thankful for the work they all do for our community in their many capacities. 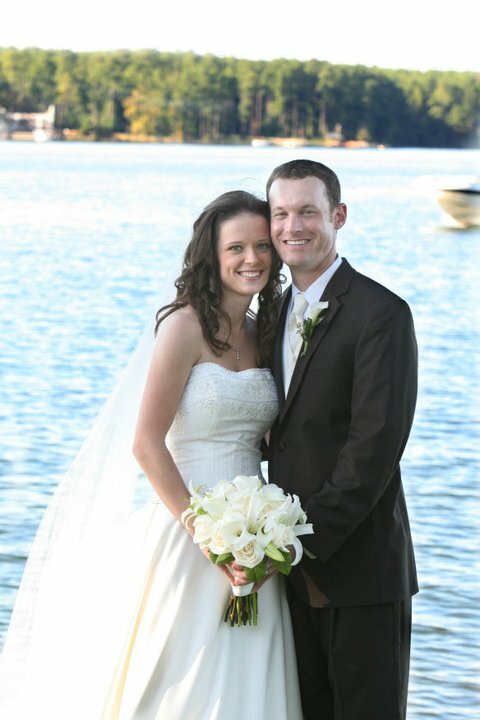 Brittany and Mark were married on Saturday, June 15th at a private home on Lake Murray. 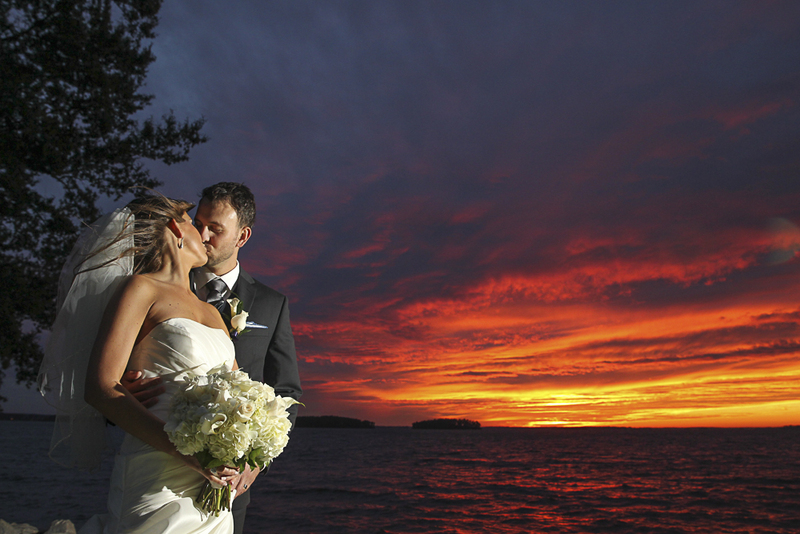 It was truly a beautiful setting for this sweet, southern wedding. When I met with Brittany and Angela (the Mom), we discussed the details and I was so impressed with how relaxed and laid-back Brittany was. I love it when a Bride lets me know what she wants and describes her vision for the flowers and then trusts me to make it happen! A trait that both she and her sister had! 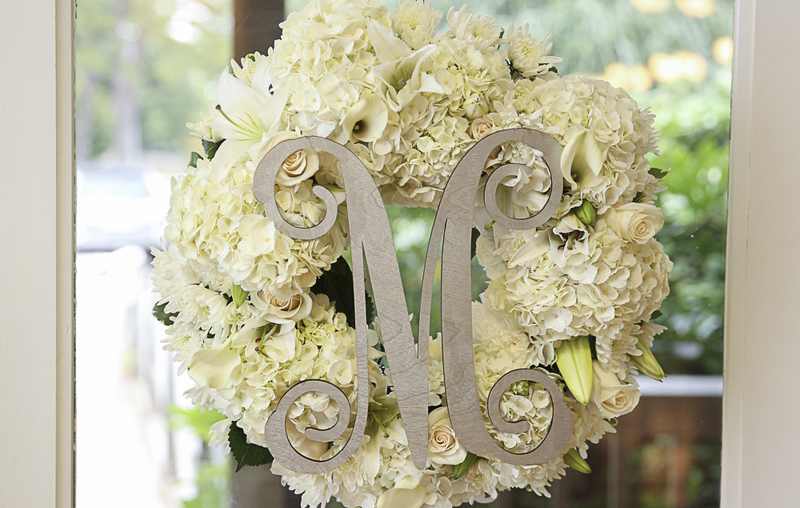 For the ceremony, we added white hydrangeas to their mason jars that hung on shepherd’s hooks along the aisle. Angela made a beautiful aisle runner, which was truly a labor of love when you saw how long that aisle actually was!! 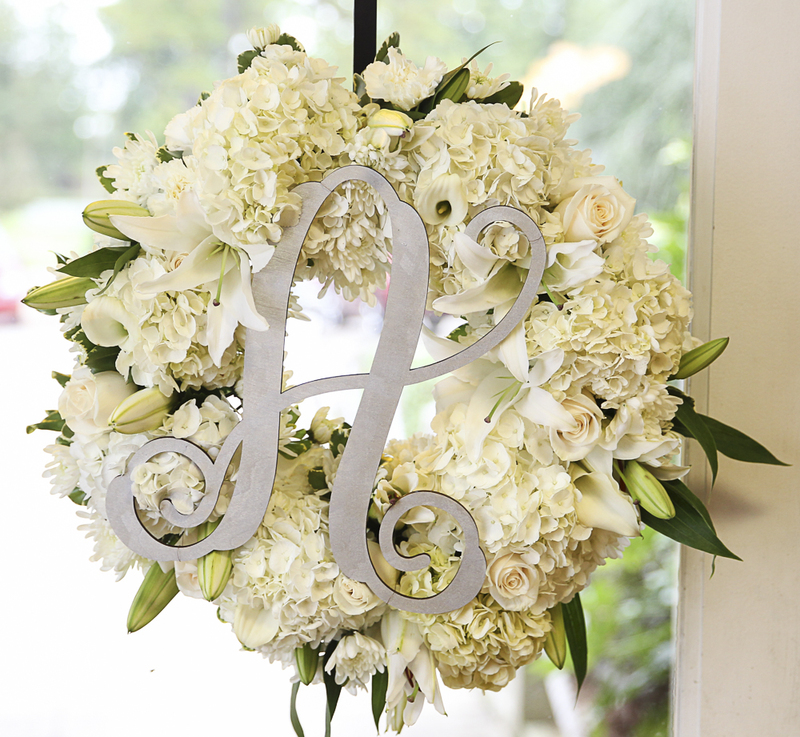 We also made a wreath of all white flowers, to hang on the beautiful wooden cross made by the Bride and Groom. 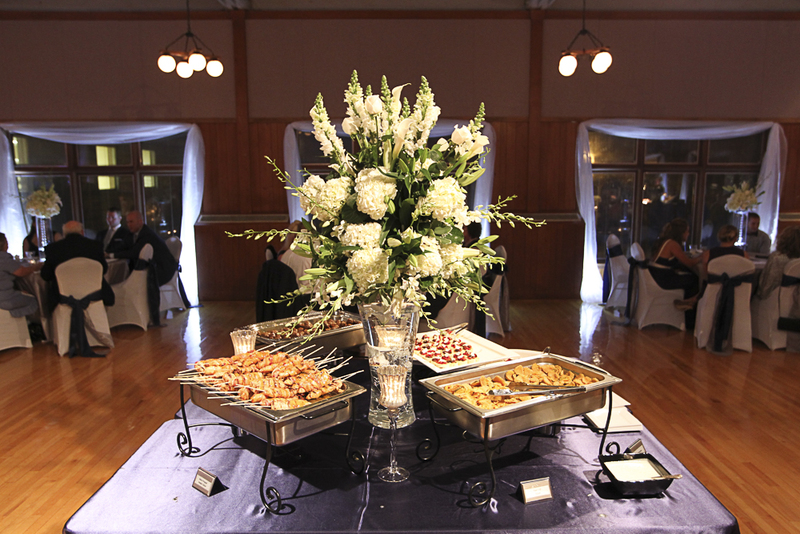 For the reception, catered by Hudson’s Classic Catering, we made a large arrangement for the main food table. 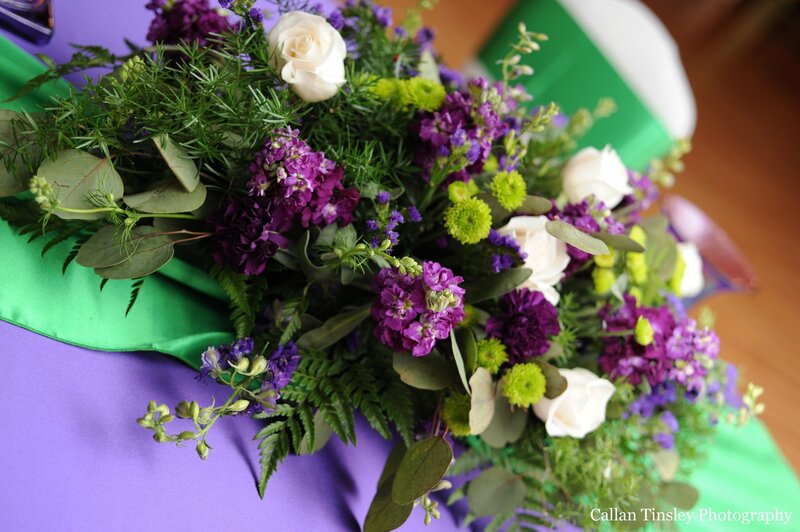 It included Hydrangeas, of course and Bells of Ireland, roses, carnations, stock and assorted greenery. 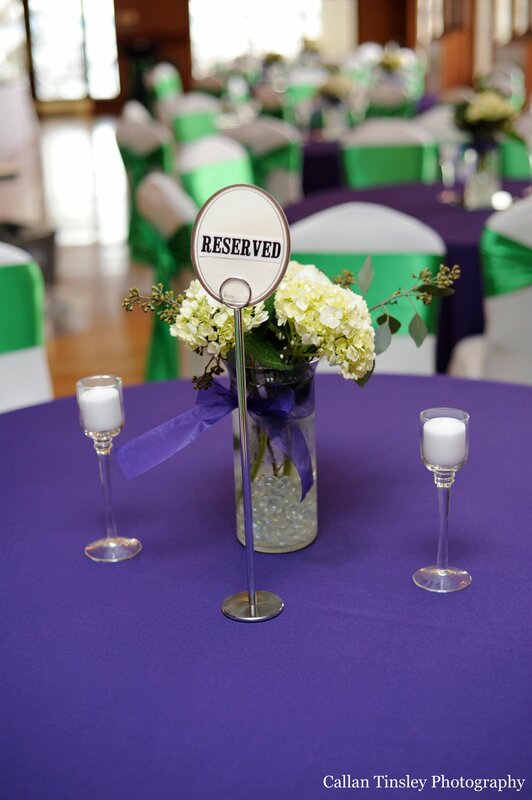 There were also mason jars with hydrangeas added to the various food stations. For the cake, we added hydrangea blooms and pale green carnations around the bottom. Lee with Event Management did a great job with the tents and overall set-up. It was a beautiful wedding and I am so glad that we got to be a part of it! Congratulations, Brittany and Mark! I wish you many, many years of happiness together! 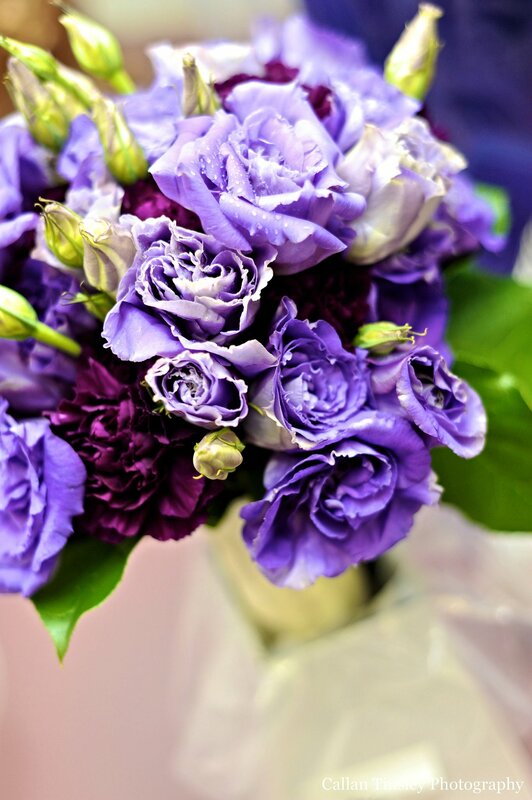 I have included a few beautiful photos taken by Ash Little Photography that show the floral details. Jessica and Brad are celebrating their 2nd anniversary today and I thought I would tell you a little bit about their wedding flowers and a few other details from their special day! 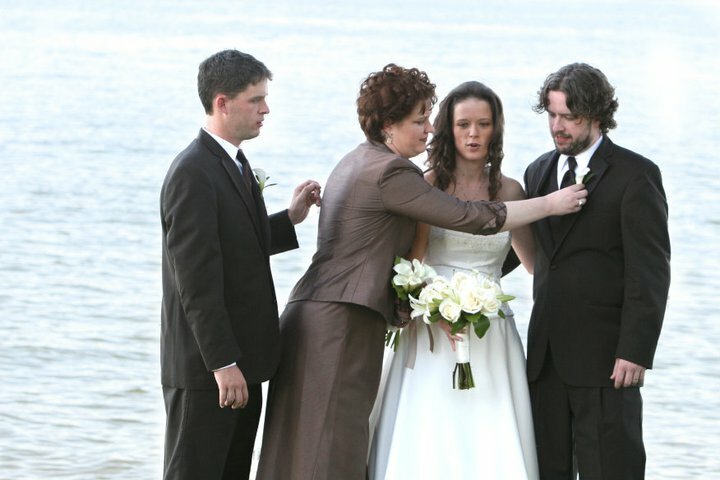 This was a very special wedding for me since I was the sister of the bride! 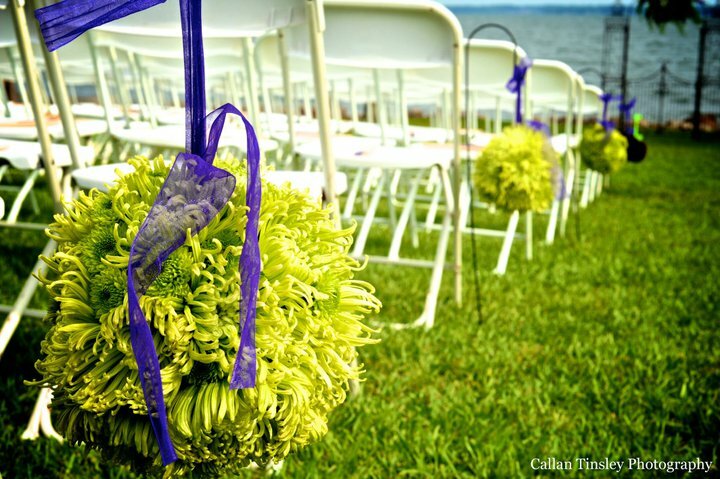 I had the privilege of being the Matron of Honor as well as the wedding florist! 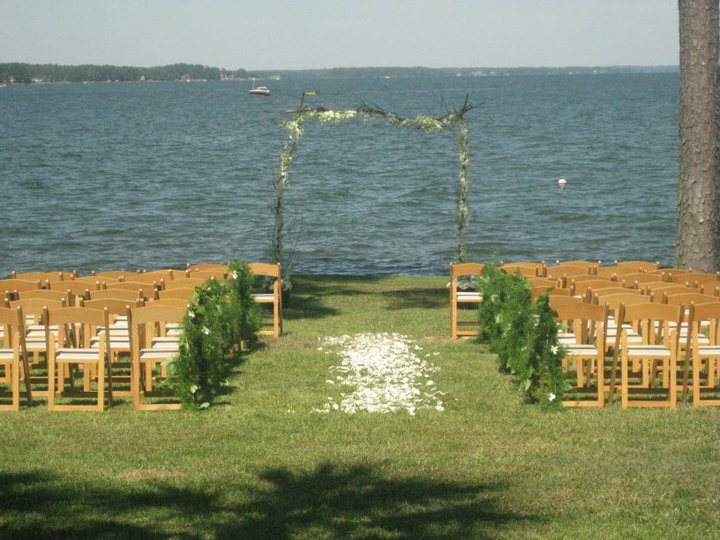 The location for the ceremony and reception was also very special since it was our parents house on Lake Murray. There were so many personal touches incorporated in this wedding and I’m honored to have been a part of it along with our very special family & friends and some great wedding professionals too! Jessica and Brad worked with Beth DeRidder (Columbia Printing & Graphics) and created some of the coolest invitations and programs I have ever seen! The invitation was actually a CD that included some of their favorite songs and the program was like a playbill with production and set design credits, etc. Very creative and unique! Jessica found her gorgeous dress at BellaVista. I had the pleasure of dress shopping with her and our Mom and you should have seen her face light up when she found “THE DRESS”. Their photographer was Renee Ittner McManus and she took some amazing photos! Simply Delicious did the catering and also made the yummy cake! Their wedding color scheme was chocolate brown and ivory. 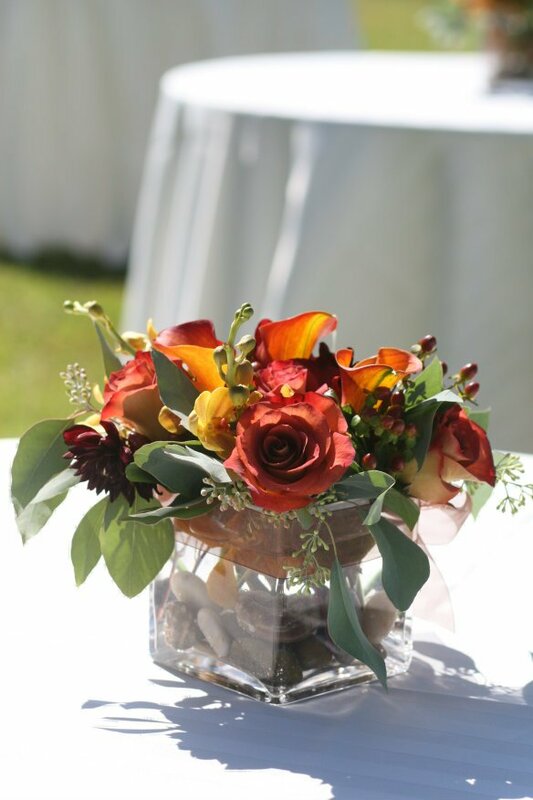 We mixed in dark orange with some of the flowers for a little punch of color! 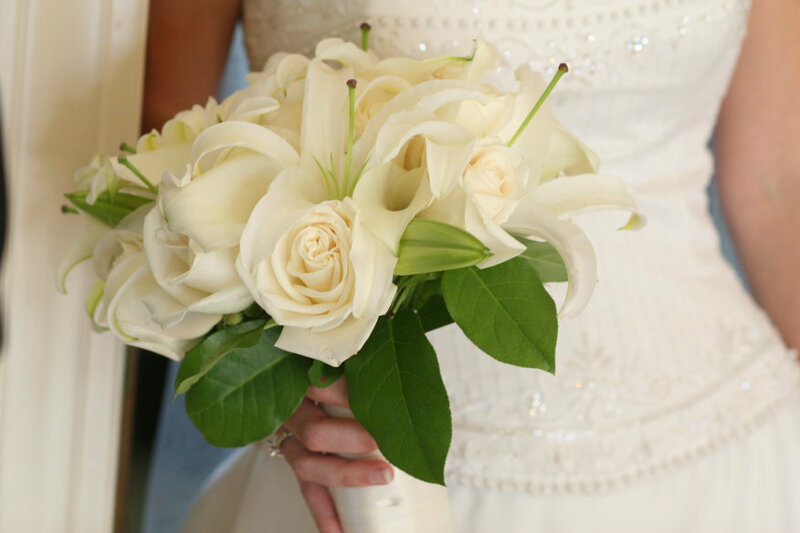 Jessica carried ivory roses, calla lilies and white oriental lilies in her bouquet and I carried white calla lilies in mine. 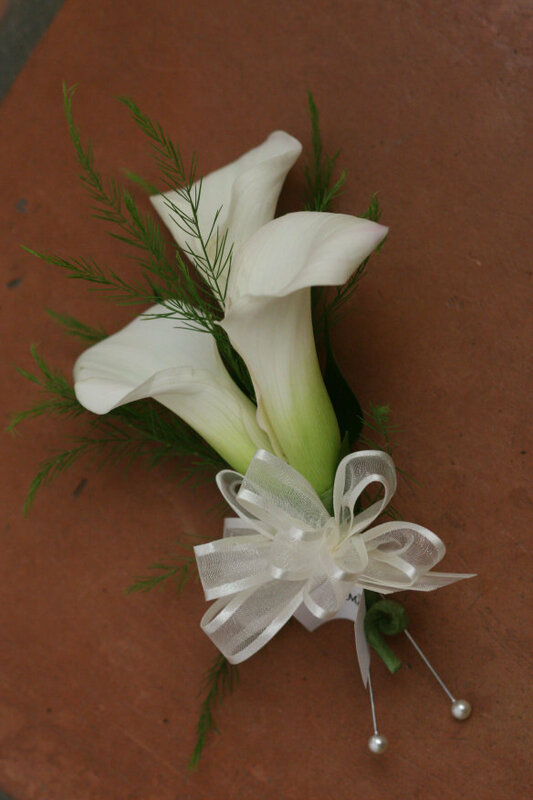 All of the corsages and boutonnieres were made out of white calla lilies, as well. 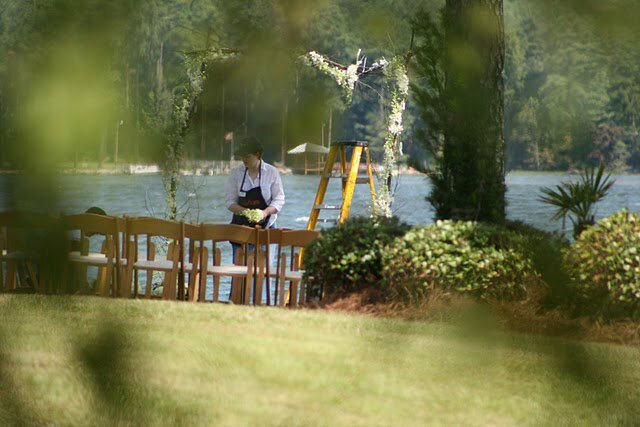 We constructed an arch for the ceremony on the wedding day (with a little assistance from the Groom), made of birch branches and added stems of white dendrobium orchids. 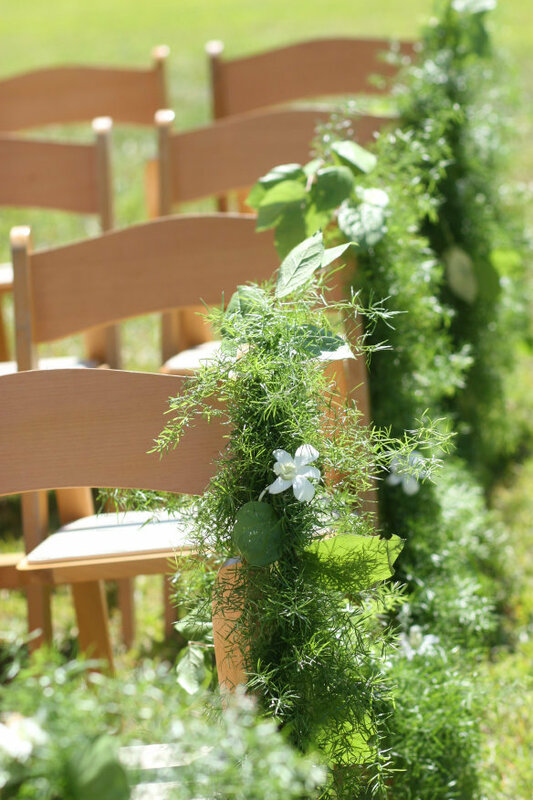 We draped a greenery garland all the way down the aisle and added orchid blooms for a finishing touch. We also placed ivory rose petals down the aisle. 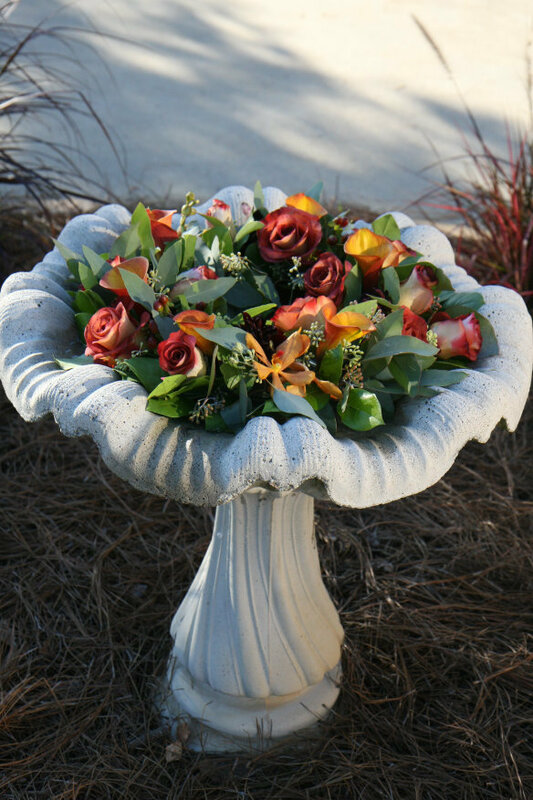 When weddings take place at a home you are able to incorporate flowers in unique places such as a bird bath, where we added a ring of flowers in rich fall tones. 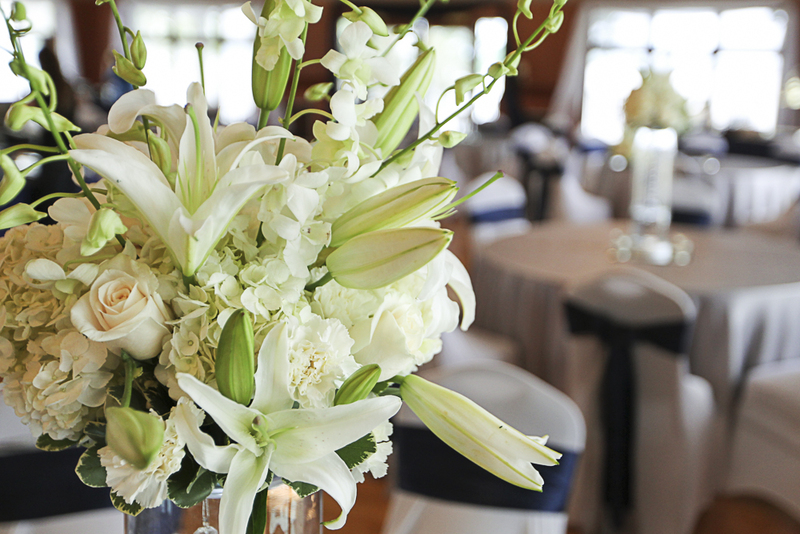 We designed vases of mango calla lilies and greenery and placed on the food tables. 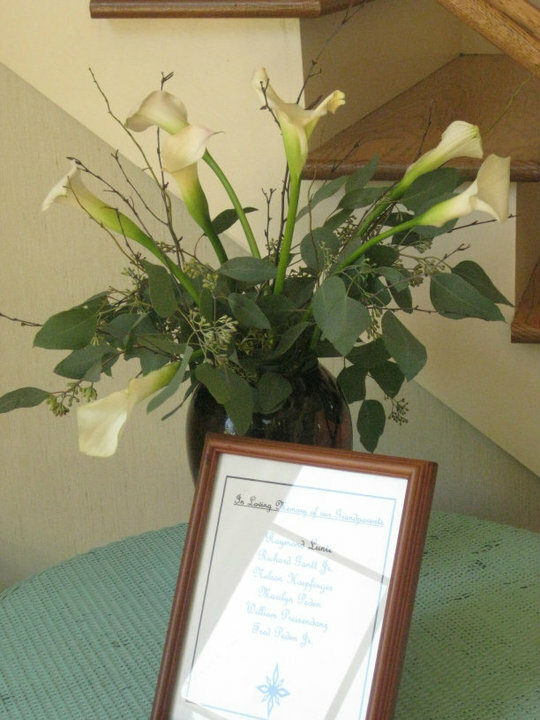 There was also a vase of white calla lilies in memory of each of the Grandparents that had passed away. For the reception we made centerpieces for the guest tables in cube vases with river rock and accented with brown ribbon. 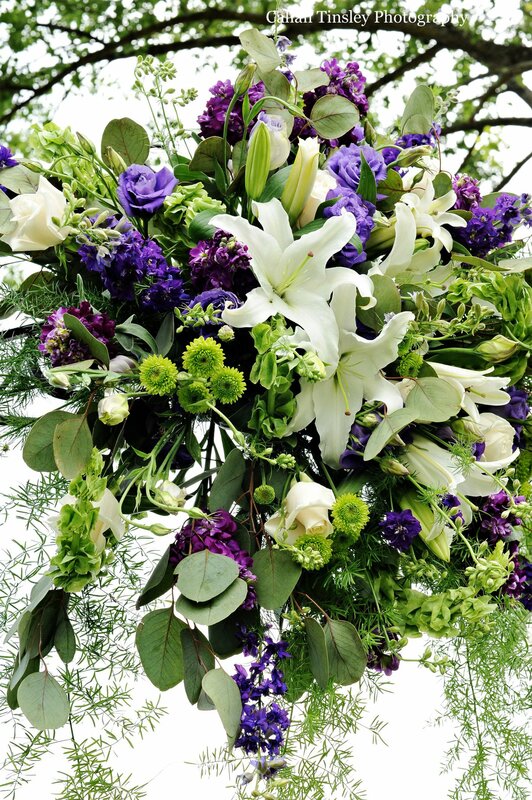 They included mango calla lilies, leonidas roses, dahlias, orange mokara orchids, seeded eucalyptus and hypericum berries. Brad also surprised Jessica with a bouquet of roses in a special hand-blown vase he had made for her at Disney World. 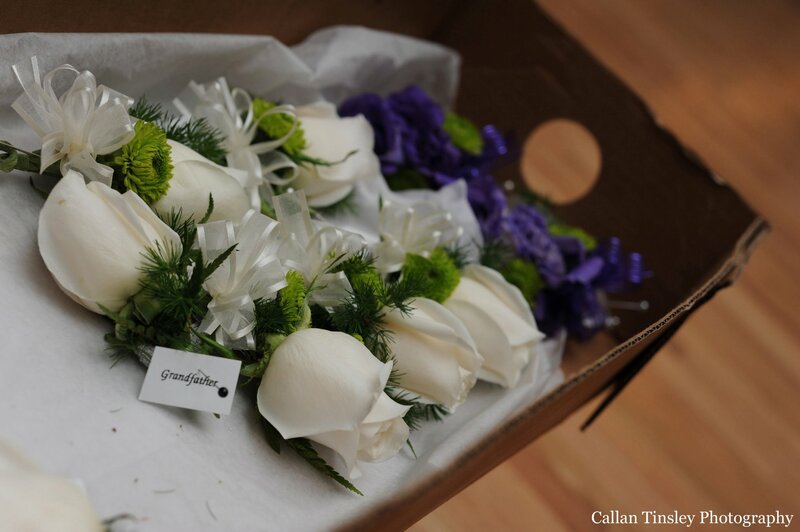 We delivered the bouquet to her while she was getting ready and she loved it! 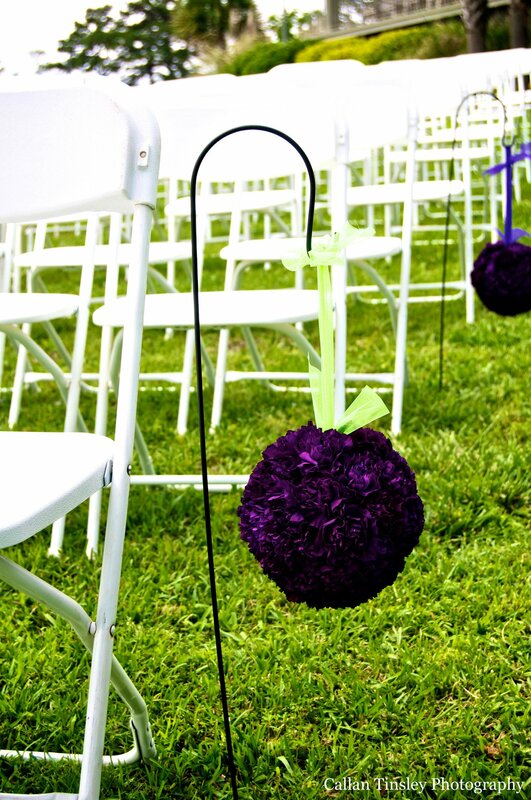 Grooms – this is a great idea for you to keep in mind for your wedding! Such a sweet gesture! Well, I think that about covers it. I have included a few photos from their big day! Enjoy! Happy 2nd Anniversary, Jessica and Brad! 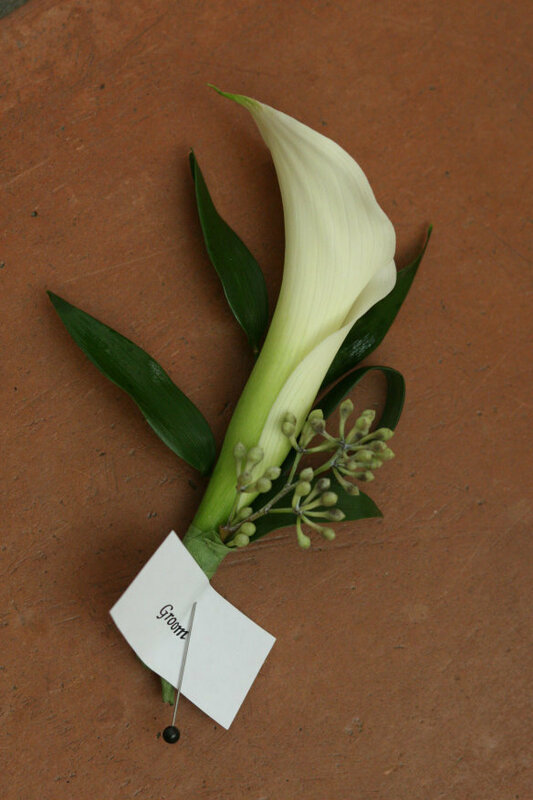 The Matron of Honor/Florist can’t have a crooked boutonniere!